As the winter nears its end it's a bit of a struggle for anything truly interesting to cook. It's also a struggle to find any Canadian ingredients to work into the meal in celebration of the snoozefest that is ice dancing. With ice dancing finally over I felt an enormous sense of national pride in knowing that it would be four more years before I'd have to struggle through watching any of that again. 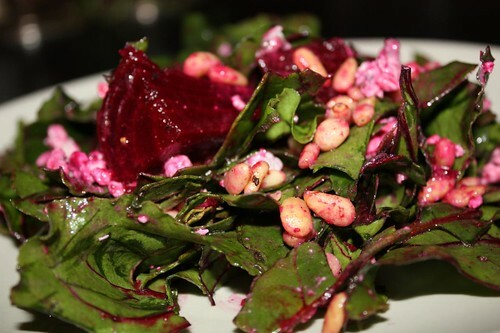 In honor of the Canadians beeting the competition to win gold last night I made this salad with beets, beet greens, pine nuts, blue cheese, lemon, olive oil, salt, and pepper. It was also in honor of beets being on sale and the fact that I think beet greens are the most delicious of all the greens. But mostly because of that ice dancing thing. I love those ice dancers! [INSERT THEIR NAMES HERE] are awesome! In honor of the American defeat I made this pasta. 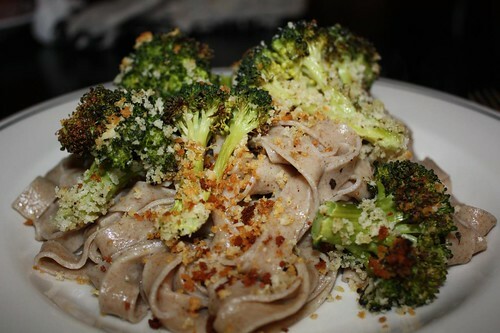 I roasted the broccoli with a little olive oil and bread crumbs then put it on top of some whole wheat fettuccine. George H. W. Bush hated broccoli. Therefore this is just adding a little more salt to America's wounds. Go Team Canada! In honor of Argentina's zero (0) athletes at 2010's winter games we had this torrontes wine. It went well with the light pasta and represented its country with great pride. It was so good I think it earned itself a platinum medal in the 5km wine-pairing event. I just love an Olympic-themed meal! Chi Fan Le Mei You? I Sure Like Those Sports Games!